From "Moonglow" to "Body and Soul"
Whether he was dubbed "the Father of the Tenor Saxophone," "the best tenor player in the world" or as this All-Region concert DVD from Standing Oh!vation notes "the true originator of the tenor saxophone as a solo instrument in jazz," Coleman Hawkins had an enviable professional run that lasted for roughly forty years. Moving from piano to cello to the tenor saxophone before the age of ten years old back "when the saxophone was considered a novelty instrument, used in vaudeville and as a poor substitute for the trombone in marching bands," Hawkins' career flourished by the time he turned twelve, working for Mamie Smith's Jazz Hounds until he eventually found a home with the newly formed Fletcher Henderson Orchestra, playing alongside Louis Armstrong. Conquering fans around the globe by moving to Europe in the '30s where he collaborated with Django Reinhardt and Stephane Grapelli-- when he returned back to the states, he still managed to outshine the up-and-comer Lester Young "by winning a few heated jam sessions," but he never neglected to share the spotlight-- celebrating artists from all backgrounds as a band leader as well as sharing the stage and the recording studio with such legends as Miles Davis, Thelonious Monk, John Coltrane, Duke Ellington, Dizzy Gillespie, and Sonny Rollins. Recording the first ever "unaccompanied saxophone solo, 'Picasso,'" Hawkins managed to remain current by listening to all styles although intriguingly he noted that he preferred live jazz concerts and bought very few albums in his genre, instead favoring the passion of opera and classical compositions by Bach. In this extraordinary DVD that offers viewers a chance to see Hawkins perform in London, Paris and Brussels in the early to mid sixties (just a few short years before his death), we're treated to some previously unreleased and remarkably rare footage over the course of its approximately one hundred and thirty-six minute running time. Cherishing the intricacies of the music and the way that Hawkins gave unprecedented solo opportunities to his talented bandmates that change over the course of the included concerts-- the disc introduces each individual segment by announcing the date and location as well as the full line-up of musicians and name and composer of each track played. Jumping around in chronology, we begin in London's Town Hall in 1964 that features some beautiful slower pieces including "September Song" that shows Hawkins' strength as a sax man until the swinging "Centerpiece" keeps us moving through the old jazz classic "Caravan." Although some critics argue that Hawkins' best work ended in 1965, it's the 1966 concert at London's Royal Jazz Festival on the DVD that mostly caught my attention yet it was most likely due to the strength of its line-up including Benny Carter on alto-sax, Teddy Wilson on piano, Bob Cranshaw on bass, and the incomparable Louise Bellson on drums. With Cranshaw's bass inviting us to snap along to "Blue Lou," before Wilson sets up Hawkins to shine in the bittersweet rendition of the Vernon Duke and Ira Gershwin number "I Can't Get Started," and Hawk's trademark "Body and Soul"-- intriguingly the knockout tune in this particular concert and indeed the entire DVD is in the "Disorder at the Border" final number which contains not only the best drumming I've ever seen in my life but makes the disc all the more extraordinary for finally offering this unreleased footage that once and for all shows the utmost importance of percussionists. There seems to be an old joke among musicians that if you can't play an instrument, just become a drummer but the Italian virtuoso Louie Bellson (a shortened version of his overwhelmingly long Italian name that would fill an entire address label) embarrasses all the drummer prejudices with an incredible performance in the nearly fifteen minute number as he offers extended solos that do for the drums what Hendrix did for the guitar with "Star Spangled Banner." A remarkable feat of music-making and a tribute to the man who sadly passed away on Valentine's Day this year-- Bellson, much like Hawkins is truly one of a kind and will definitely be missed. The DVD also contains more footage from other concerts in Paris (consisting of one brief rendition of "Moonglow" that sounds like we're just jumping into it shortly after it starts like walking into a film while the credits are rolling) and Belgium including an inferior version of "Disorder at the Border" minus Bellson that nonetheless is a peppy but alternate take featuring more piano (by Geroge Arvanitas) as well as additional tracks from the Coleman Hawkins-Roy Eldridge Sextet taken from the 1961 New York short film After Hours. And while it's filled with some standout pieces, once Bellson rips into "Disorder" during the tenth track, it's all downhill from there. Still, a great find that's a rare treat for Hawkins fans and one that-- when I say "downhill" just means in comparison to "Disorder" but still remains far better than what sadly passes for jazz in the Kenny G era of today. 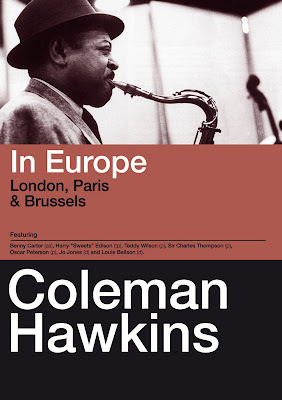 Coleman Hawkins In Europe is not only worth hunting down for jazz aficionados and those who worship the sax but one that should be shown to every drummer working today. Highly recommended and thankfully compatible with each and every region code DVD player Coleman Hawkins In Europe marks another fine entry into the historically important and downright entertaining Standing Oh!vation collection.